Cyril and his wife, Sarah (who went by "Sally") were pioneers in every sense of the word. They started out in Vermont, where they purchased and cleared land for a farm. After a while, they and their large family moved to north eastern Ohio where they again purchased and cleared property for a farm. While in Ohio, Cyril and his family joined The Church of Jesus Christ of Latter-day Saints. They moved west with the Church to Missouri, then to Nauvoo, Illinois, and eventually settled in Davis County, Utah, in the area that is now called Bountiful. 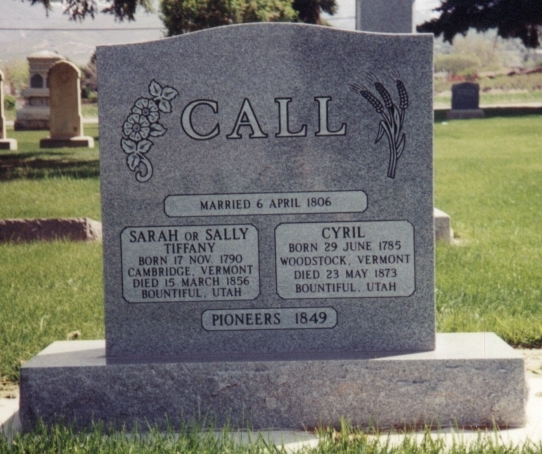 Many members of the Call family, including Cyril and Sally, were buried in the Bountiful Cemetery. Perhaps the most famous of their vast posterity was their son, Anson. One of the best places to search for information about Anson and the entire family of Cyril Call is an excellent book called Anson Call and the Rocky Mountain Prophecy by Gwen Marler Barney. It is very well written and researched, and is filled with photographs, diagrams, maps, and other illustrations. We highly recommend it. The book was published by Call Publishing in Salt Lake City, Utah, and its ISBN is 0-9721527-0-9. If you have any questions or comments, or would like to share information about the Call family, please contact us at postmaster at sedgwickresearch dot com. Photograph of Cyril Call with his eye open: This picture was sent to us by Clint Booth. Thank you Clint! The Autobiography of Anson Call: From the journal of Anson Call up to 1839. (This is only part of his journal. If anyone has the rest of the journal and would like to share, please contact us. Thank you!) An excellent article, entitled "Anson Call: Man of Action" was written by Thaya Eggelston Gilmore, and published in Ensign magazine. Click here to read the article. 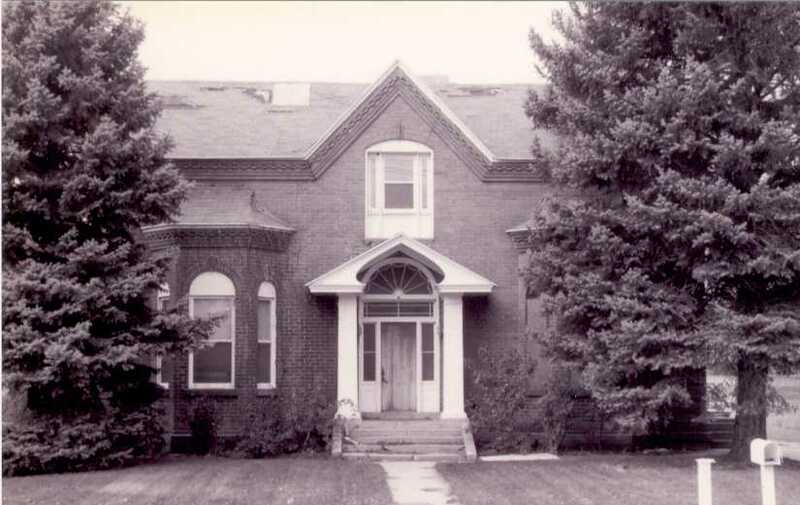 Anson built a nice home in Bountiful for his wife, Mary. Click here to see a picture of it. This picture was provided by Andrea Lee. 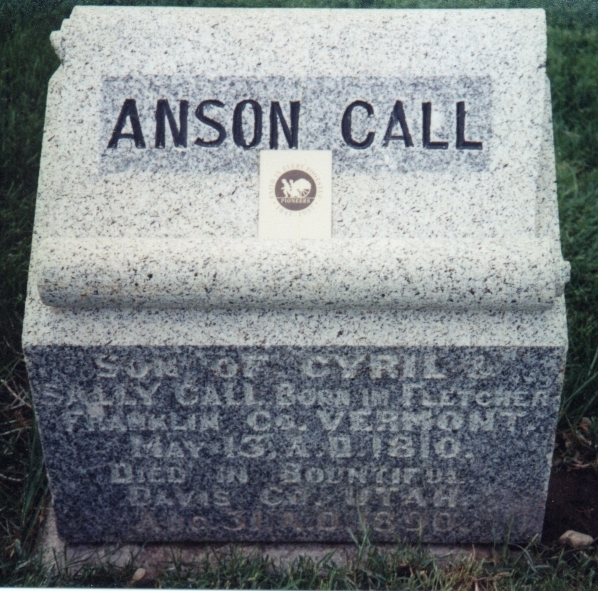 Photo of Anson's headstone, in the Bountiful Cemetery. Photo copyright 1998 by Sedgwick Research. Emma Summers Call: Emma was one of Anson's wives. 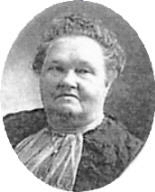 She was a member of the Willey Handcart Company, along with Margaretta Clark. 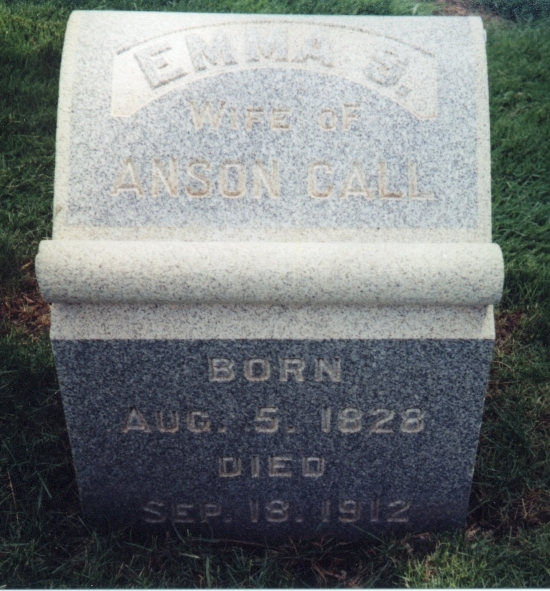 Photo of Emma's headstone in the Bountiful, Utah cemetery (copyright 1998 by Sedgwick Research). Lucina Call Sessions: Lucina was the daughter of Cyril and Sally Call, and the wife of Perrigrine Sessions. 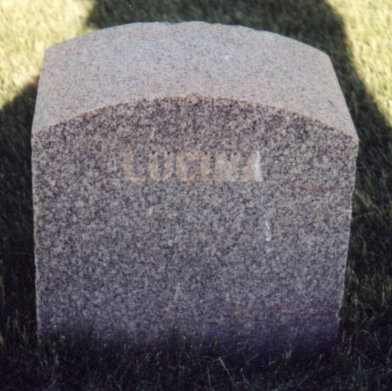 Photo of Lucina's headstone. Photo copyright 2000 by Sedgwick Research. The Life History of Ann Call Sessions: Ann was the daughter of Anson and Emma Summers Call, and the wife of Keplar Sessions. Photo of Ann Call Sessions. Ann had a business in Chesterfield, Idaho, where she made and sold dairy products, such as butter. This photo of a butter wrapper and the photo of Ann were provided by Andrea Lee. The Life History of Fanny Call Barlow: Fanny is also the daugher of Anson and Emma Summers Call. She married Truman Heap Barlow. 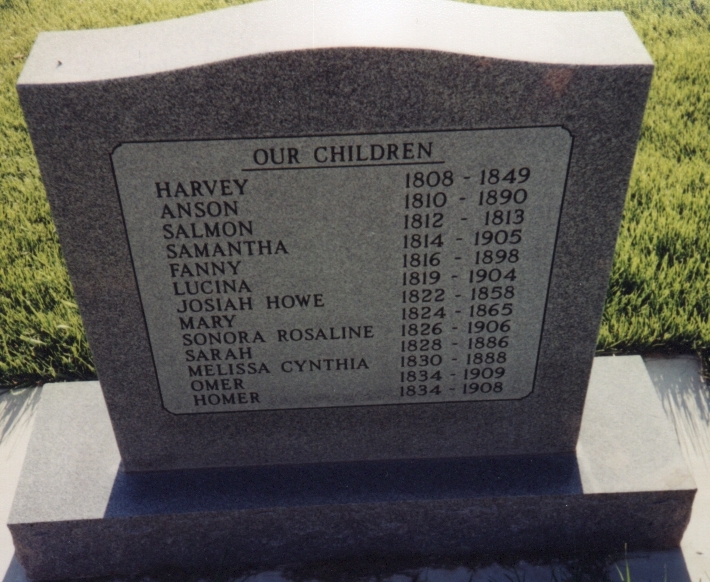 Truman and Fanny raised a wonderful family, and lived in both Bountiful, Utah, and Chesterfield, Idaho. For more information about the Call family throughout the world, please visit the Call Family GenForum. Cyril Call's Family at R. Knowley's Web site. Bountiful Memorial Park: This is the Bountiful Cemetery where many Calls are buried. The Web site for the cemetery is very useful. It gives contact information, travel directions, the history of the cemetery, maps, and other information about the cemetery. Bountiful's Sister City, Chesterfield, Idaho: Chesterfield was founded by people from Bountiful, Utah, including many Calls. In fact, it was founded by Chester Call. Chesterfield Foundation: The Chesterfield foundation is working to restore historic Chesterfield to its former glory. Please visit their site and donate to the cause.